Emoji birthday display bulletin board. 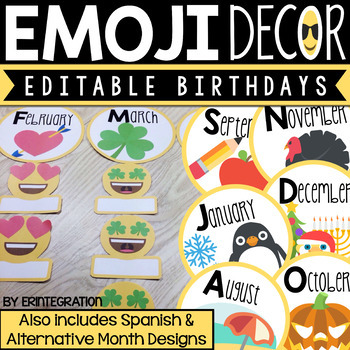 Create an Emoji themed birthday display, bulletin board or interactive graph! Several options for displaying - can also be used as a back-to-school graphing game. 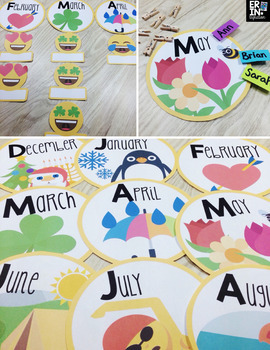 Includes Emoji themed month cards, 12 styles of mini Emoji labels for displaying student names, and a sign. Names are EDITABLE with included PDF and PowerPoint file or print blank and have students write their own name! 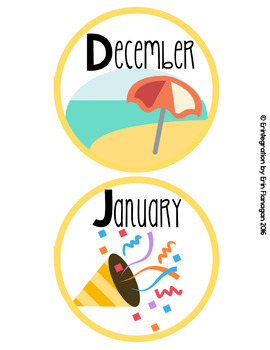 Also includes alternative month cards for my Southern Hemisphere friends and a set of all month cards in SPANISH! 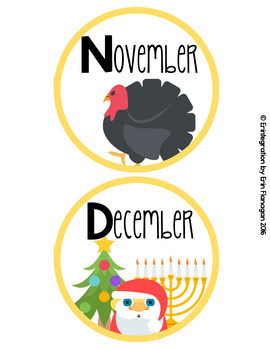 Sized to fill a bulletin board or space under the chalkboard. You can also use your printer settings to print smaller! Or use just the monthly headers with clothespins for a space-saving display! ★ Editable PowerPoint and Editable .pdf file with 12 pages to add student names to mini Emojis. 6 mini Emojis per page. Fonts are embedded on the .pdf for a uniform look. ★ 12 colorful monthly headers - includes alternate options for September, November, December, January, April, May, June, July, and August. ★ SPANISH set of all monthly headers (including alternates).